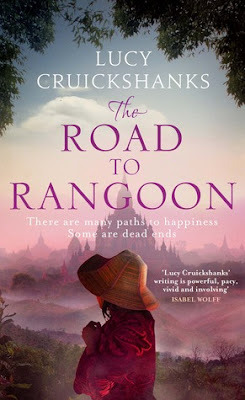 Lucy Cruickshanks, an English author, has penned yet another enticing and poignant tale, The Road to Rangoon that is set across the beautiful yet sad land of Burma which is centered around three characters whose lives are entwined and engulfed in the clutches of the civil war against the Burmese Military Armed Forces, officially known as Tatmadaw. In 1980s Burma, the British ambassador’s son goes missing. Discovering himself in the north of the country, Michael Atwood is in imminent danger, trapped between sides fighting a bitter civil war and with no way back to Rangoon. His best hope of salvation is to trust Thuza, a ruby smuggler who offers to help him escape. Beautiful and deeply scarred, Thuza has spent her entire life in a frontier town between rebel and government forces, never choosing a side but trying to make a living from both. For Thuza, the ambassador’s son is her ticket out of poverty. For Than, an ambitious military officer, exploiting those caught in the war offers an opportunity for promotion and distinction. But as all three learn to their cost, in this enigmatic and savage country, everyone has a price. From the heart of Burma’s exotic Rubyland comes an emotional thriller, as three lives are thrown together by the desperate choices they make to survive in a country gripped by civil war: a tale of ambition, salvation and hope that confirms Lucy Cruickshanks as a master storyteller. Michael Atwood, the son of a British Ambassador in Burma goes missing and soon he realizes that he is caught in the war from both the sides and the power they holds on his capture is invaluable, that is when he needs to trust the only person who can help him to rescue from the grips of the rebels. Thuza, the local Burmese girl, is a ruby smuggler, who knows her job well like the back of her hand, on how to differentiate ruby from the rocks, as it is the only salvation to buy her parents' freedom from the right officials. Than, works and abides by the strict rules of the Tatmadaw army, is soon tested on his loyalty towards the Army, and he is forever desperate to climb the ladders of success by pleasing the General. Things change when he forces his son, Min, to join the forces and to take strict measures against those who wrong by the Armed Forces. These three lives in Burma, now known as Myanmar, will break the hearts of the readers as their lives unfold and when their fate plays a major role to bring them together under dire circumstances. The author has once again delivered a spectacular tale of love, freedom and loyalty towards one own government set against the back of another country from the far east- Burma, which harbors a difficult era in Burmese history, which not only torn apart the lives of the common man, but which made it impossible to survive under the dominance of the Tatmadaw army. The author has evocatively captured the time frame as well as the location with her eloquent words. The background of Burma is dominated by lush and dense green forests and the tombs of the many Buddhist temples and that the author has vividly captured in her story line. The land where beauty of mother nature and repressive army plays a major role, is well painted into the canvas of the story as the author strikingly captures the culture, the local dialect and the grief of the citizens through her story. The author has done her research quite well with the ways how to find a ruby among the rocks, where to find it, and also the governance of the army and their torture among common people. The author's writing style is spell-binding that I lost track of time as I devoured the novel in just one sitting. The book is highly addictive as articulate narrative shifts from one character to another. The pacing is really fast, despite the fact that the author has written the scenes descriptively, that made it easier for me to picture the events right in front of my eyes. The story is engrossing and kept me glued till the very end. The author has penned with so much deep, moving emotions and it definitely felt like she has poured all her best emotions into it. The characters are drawn with realism and simplicity. The challenges thrown on their track made me rooting for them. All the three characters are inspiring and sad laced with grief and their demeanor is something to watch out for when they are caught in the politics and the war with the government and they are bound to leave an impression long after the end of this powerful historical fiction. The story has a complex and nostalgic ending that definitely moved me. The supporting characters are highly well-developed. Overall the story is enthralling, thought-provoking and thoroughly gripping till the end set against the back drop of Burma in the late 20th century. Verdict: Definitely a must read for all historical fiction lovers. Courtesy: Thanks to the author, Lucy Cruickshanks, yet again, for giving me an opportunity to read and review her novel. Author of THE TRADER OF SAIGON (2013) and THE ROAD TO RANGOON (Sept 2015). Published by Quercus. Lucy Cruickshanks’ love of travel inspires her writing. A great fan of the underdog, she’s drawn to countries with troubled recent histories, writing about periods of time when societies are at their most precarious and fraught with risk. She’s fascinated by their uniqueness and moral ambiguity, and in capturing the people who must navigate them. Her debut novel, The Trader of Saigon, began life after she sat beside a man on a flight who made his fortune selling women. It was shortlisted for the Authors' Club Best First Novel Award and the Guardian Not The Booker Prize, longlisted for the Waverton Goodread Award and named a Top Ten Book of 2013 by The Bookbag. Patricia Highsmith, Amitav Ghosh and George Orwell have all influenced Lucy’s writing, but her favourite books are Empire of the Sun by JG Ballard and Life of Pi by Yann Martel. Lucy was born in 1984 and raised in Cornwall, UK. She holds a BA in Politics and Philosophy from the University of Warwick and an MA in Creative Writing from Bath Spa University. She lives on the south coast of England and divides her time between writing and caring for her young family.